Inciting Americans at home to do their part in producing for the war effort, the poster-inexpensive, accessible, and ever-present-was an ideal agent for making war aims the personal mission of every citizen. From 1941 to 1945, government agencies, businesses, and private organizations issued an array of poster images linking the military front with the home front, calling upon all Americans to boost production at work and at home. The U.S. Office of War Information created the "Poster Pledge," urging volunteers to "avoid poster waste," "treat posters as real war ammunition," and "never let a poster lie idle." This colorful collection of over 150 World War II-era posters focuses on the theme of wartime production on the home front. The range of designs and images will inspire graphic designers, while the descriptive captions and informative text will interest history and military buffs. Some of the famous slogans these posters introduced include "When you ride alone you ride with Hitler," "She won't talk-will you? The enemy has ears," "This is America... Keep it Free," and "Remember Pearl Harbor-purl harder!" 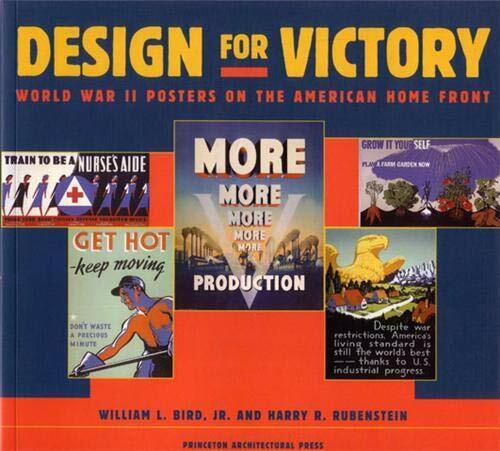 Design for Victory is a magnificant visual experience that captures America's ideological and cultural transformation during the nation's most popular 20th century war. Harry Rubenstein and William Bird have not only assembled a stunning set of images, but these two fine historians have also uncovered a set of class and gender transcripts that give unexpected tension to so many of these patriotic, productionist drawings and slogans. This poster book has punch! Nelson Lichtenstein, University of Virginia, author of Labor's War at Home: the CIO in World War II. Bird, William L. and Rubenstein, Harry R.
Bird, William L.; Rubenstein, Harry R.